Inspired by the "Cool Jazz" West Coast scene of the fifties. with a great response on ride cymbals. Well balanced nimble sticks - perfect for what I want! Still doesn't have the unique intimate feel that your original sticks had a few years ago, but does have a great feel. I will be happy to use them. My go-to stick. I play a wide variety of music - from Jazz to Rock to Funk to Gospel. While I gleefully use the Memphis R&B, the Birdland, and the Rythmn & Groovz sticks, this stick always lays it down with great feel, balance, and timbre. Nothing but Bopworks sticks for me! I am currently using the Birdland Model as my main stick, I recently added the West Coast Sound as my second pair when I need just a bit more sound. I am currently playing in a Jazz Quintet that utilizes Acoustic Bass and Piano. And we don’t use a PA. Very Old School! And Bopworks has exactly the stick that I have been looking for. Both pairs have their own voice. And both are very well balanced. THANK YOU so much for making such a Awesome Product!!! This was the first time I've ordered Bopworks sticks and got 3 models. This and the 40s swing classic are my favorite! The quality is apparent as soon as you hold the stick. I was also struck by the fact that each stick created the same pitch when striking the cymbal or drum. While other companies claim pitch matching in pairs I have often had to switch sticks out of packs to find ones that are weighted evenly and of the same density. These are awesome! I'm a performer drum teacher who has to play anything from indie rock, to metal, to jazz, to Motown in a given day. These sticks feel amazing in both light and heavy touch. They are durable enough to withstand the heavier stuff, but delicate enough to communicate subtle nuances. Best of all (and most importantly), they sound amazing. These are now my go-to sticks for all occasions, I'm so happy I discovered Bopworks. These sticks feel great and sound wonderful on the ride. They also are fairly durable, which is nice. The tips take a long time before they begin to chip off. 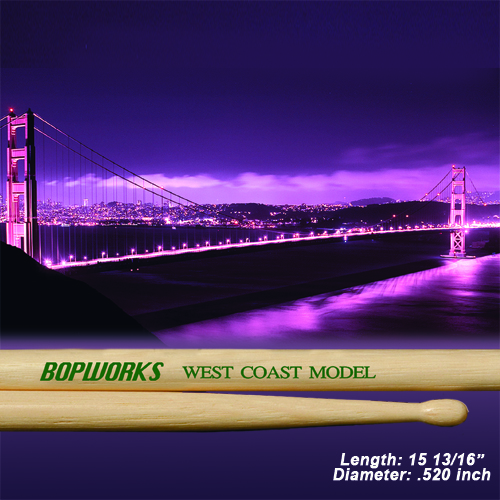 I believe that Bopworks are the best sticks for jazz on the market and the West Coast model is my favorite among these. Wonderful sticks. Nice big sound in a light package. Love the weight and diameter as well as the oval tip. Plays light with a rich sound. This is my go-to stick. You hit a home run with this one.